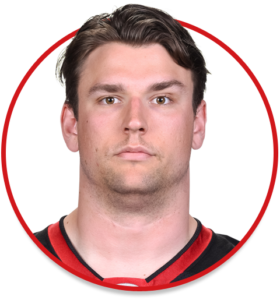 Nolan MacMillan is an offensive lineman currently playing for the Ottawa REDBLACKS. Selected in the first round of 2013 CFL Draft, ninth overall, becoming the first ever draft pick by the REDBLACKS. Re-signed by the club on February 14, 2017. Dressed for seven games for the REDBLACKS after battling injury early in the year. Played all 36 regular season REDBLACKS games through his first two seasons, manning right guard on a REDBLACKS offensive line that stayed intact for the entire season 2015 campaign … Provided pass protection that aided Henry Burris in passing for career-high 5,693 yards.